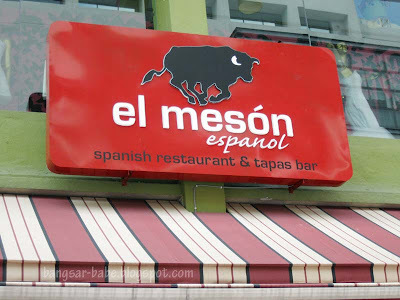 El Meson is the latest addition to the row of restaurants and pubs along Jalan Telawi 3 in Bangsar Baru. The interior is rustic and warm, with comfortable chairs and an alfresco section for you to people-watch while enjoying your meal. The executive lunch set seemed most value for money. You can choose to have the 2-course set (tapas & main) for RM35++ or the 3-course set (tapas, main, dessert and coffee/tea) for RM45++. I thought it was a good deal, considering how one main course starts from RM25 onwards and tapas can set you back between RM12-RM48. 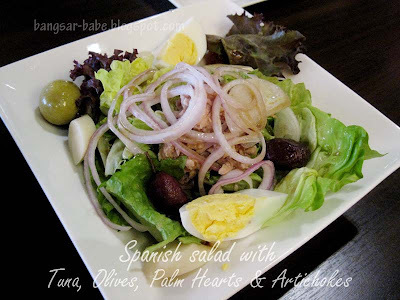 They also have a tapas set lunch (2 choices of tapas) for RM25++, and RM35++ with a glass of house wine/beer. We were off to a good start with the selection of tapas. If you think we ordered every tapas on the menu, you’re wrong. All these weren’t even half of the tapas selection, not even close. 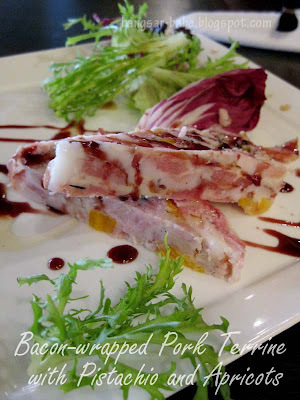 The Pork Terrine was a rough-textured terrine of pork studded with pistachios, apricots and fatty bacon. It was rich and deftly seasoned. 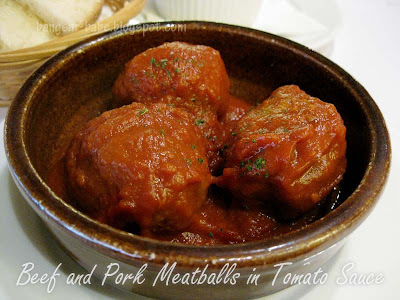 Just as good were the plump albondigas (“meatballs” in Spanish) in a full-bodied, zesty tomato sauce. Ahhh…I was in meatball heaven. Calamari fritos was nothing to shout about. 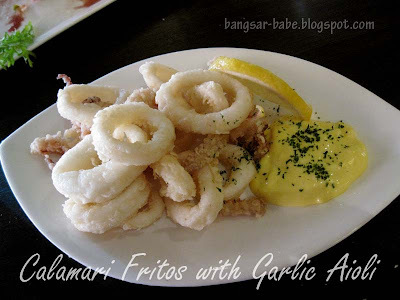 I thought the squid rings could have been crunchier, and the garlic aioli lacked body and garlic punch. 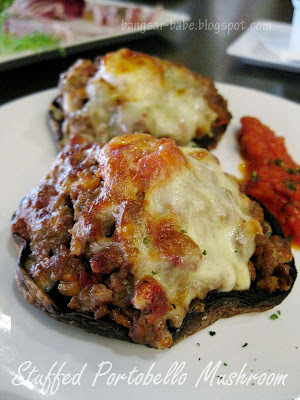 The stuffed Portobello mushrooms were meaty and cheesy with a hint of tanginess from the tomato salsa. It didn’t wow me as much, because it’s hard to go wrong with mushrooms stuffed with cheese and meat. I did not like Spanish salad one bit. Unless it comes with bacon, ham, roast chicken, cheese or all the above, I can’t be bothered. 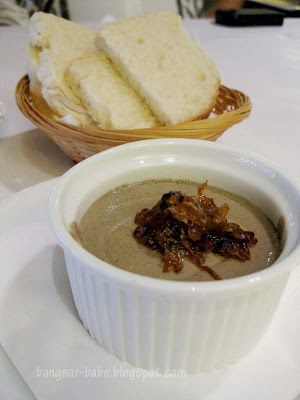 I enjoyed the chicken liver pate which came topped with sweet, caramelised onion. 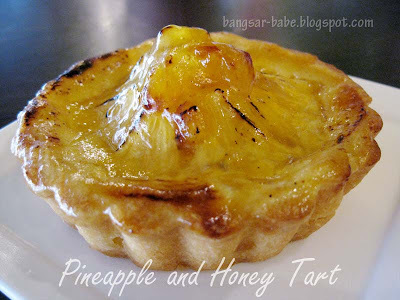 Luxurious, dense and creamy, it was delicious with crusty bread slices. The plan was to order one pork burger to share, but I insisted on having a whole portion to myself. The waiter took one look at me and said, “It’s a rather large portion. 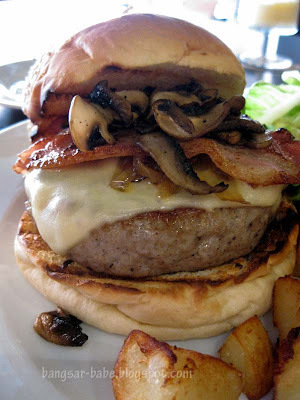 You might not be able to finish it.” To which I replied, “Bring it on!” The bun was nicely toasted and the patty was incredibly thick– topped with melted cheese, fatty bacon and sautéed mushrooms. 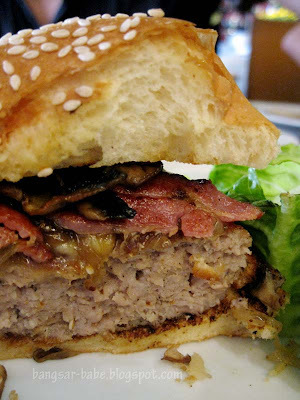 The crust of the patty had a slightly crunchy texture that gave way to a well-cooked centre. While it wasn’t oozing with juices like a good beef patty, the pork patty still had an acceptable level of juiciness. However, the patty did not stand out against all the extra flavours. I thought the meat flavour was partially concealed.And the waiter was right — I could barely move after that! 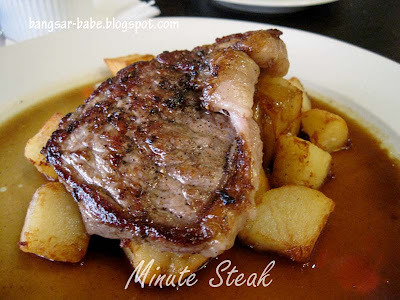 The minute steak was juicy, tender and rimmed in creamy fat. Not bad I thought — the brown gravy complemented the flavour of meat. 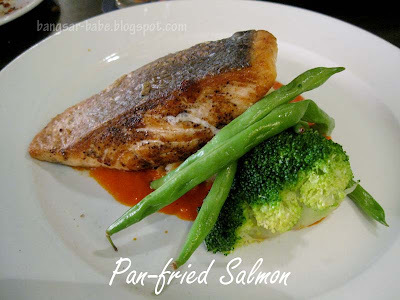 If I had to pick a dish I didn’t like, it would be the pan-fried salmon. This dish was bland and uninteresting, both in appearance and taste. 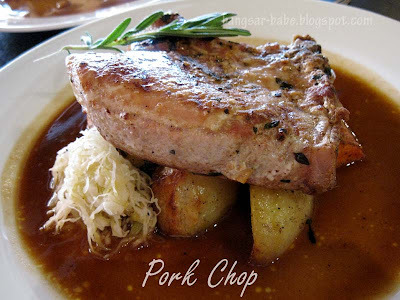 On the other hand, pork chop was delicious with much more meat than the burger. Great for those who are in an uncompromising meat mood. It was succulent, meaty and indulgent. rif was too stuffed to eat any dessert after he finished this. Desserts were not as impressive as the tapas. 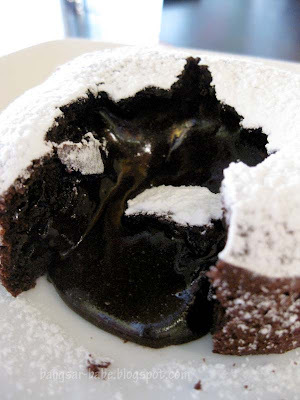 The exception was a luscious warm, round individual chocolate molten lava cake that when cut, oozed with intensely rich molten chocolate. 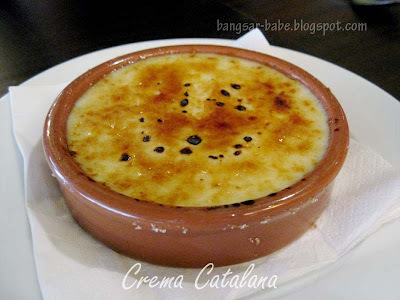 Crema Catalana (Spanish creme brulee) was a denser and sweeter version of the creme brulee. 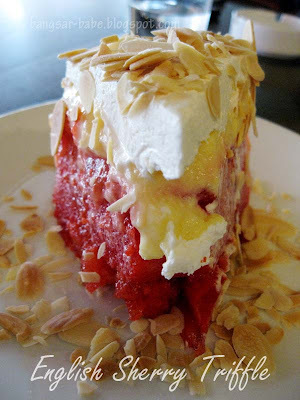 Unlike the earlier two desserts, the English Sherry Trifle was alcoholic and light. 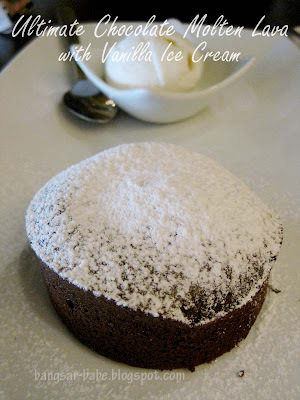 Not quite my kind of dessert, as I love my cakes rich and dense. 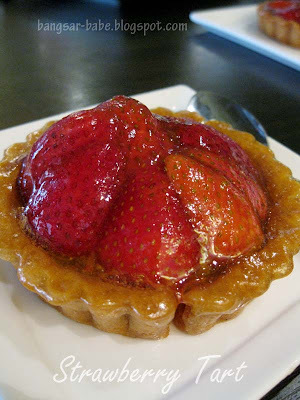 I thought the Strawberry Tart and Pineapple Tart were just average — nothing spectacular, these two. Service was friendly, but often all over the place. My coffee didn’t arrive even after reminding the waiter about it 3 times. Very unacceptable for such restaurants. The coffee arrived after I was done with desserts — but the whole point was to have coffee WITH dessert. 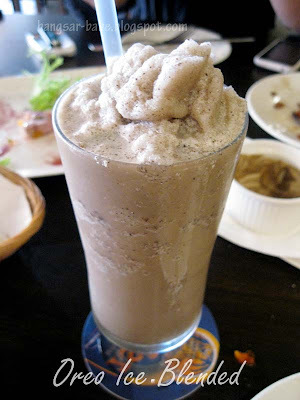 Drinks were not up to par, especially my oreo ice blended which was almost flavourless. I sent it back, only to be given a version that was pumped with syrup, but the overall bland taste was still there. Verdict: Massive portions, reasonable set lunches but staccato-ed service. for such portions (if these were set lunch portions), thats quite good, dont remember seeing their set lunch menu when we were there, all the orders were from the ala-carte menu! 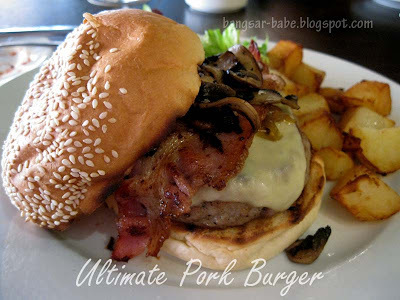 I want tht pork burger again! Yes, agree w Sean, its one of the better restaurants there..then again, Mr Ek owns a few! ken – Looks nicer, but I only liked the molten chocolate cake. nomad – Yes, it is one of the better ones around. Baby – Tapas are snacks, canapés or finger food. 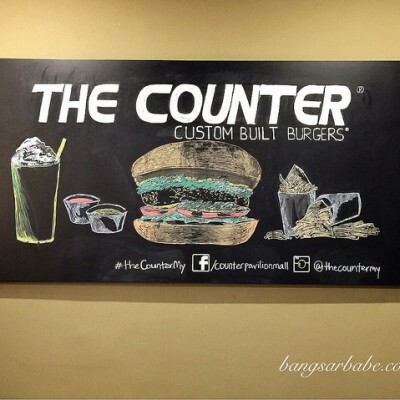 BBO – If you go, it's best you shared the burger! SimpleGirl – Very heavy lunch. I could hardly move after that! Joe – I think they recently started the lunch sets. popped in on mothers day. can't fault the food the setting, but the service is very poor. 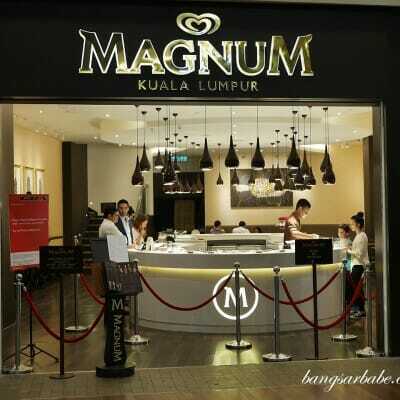 the owners were helping out, wearing very inappropriate attire & appeared to have no concept of customer service. so its hardly surprising, then, that their poor attitude has disseminated down to their floor staff. Mr and Mrs Peel – That's terrible. Hopefully, they will buck up. I hate to see such potential go to waste! How was the price? 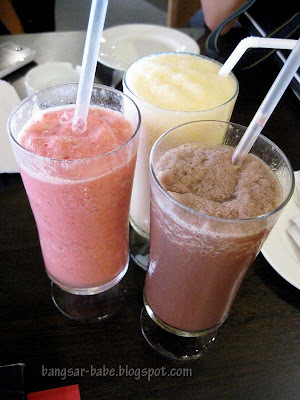 Coz i hv a frend b'day r coming, so v all thinking where v can bring he go to hv a nice meal n nice cafe. 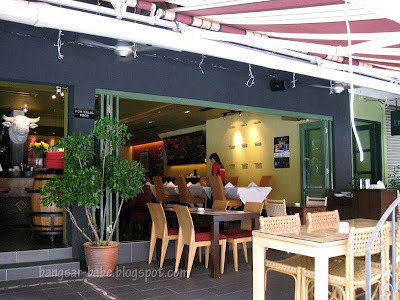 糖果Gal – Depending on what you order, it would cost between RM60-100 for a three course meal.